Early Wednesday morning, as teachers were helping students out of cars and into classrooms, Owen greeted one of the teachers with a growl. There's nothing unusual about that, because Nathan has been climbing over Owen's seat for years and the little brother has always made it a point to mess with the teacher when the door swings open. After that, however, this particular teacher asked Owen when she'd be getting him out of the car. He quickly responded with "When I am five," and I let her know she'd be getting them both out next year. I started to drive toward preschool when I realized that wasn't right. Nathan will be at a new campus for fourth-grade and Owen will be the sole Bauer at primary. In fact, Nathan and Owen will never be in the same school together. I don't know if that's a bad thing, honestly. Then I thought about how Nora and Owen will be getting out of the car together. He'll be in second-grade when she makes her kindergarten debut and while there will be off years, they'll spend a good portion of their school careers with a sibling. We'll see how long the snuggling in the tree house lasts. While it's been well documented that the Bauer Boys have a tight bond, the one between these two is also quite noticeable. 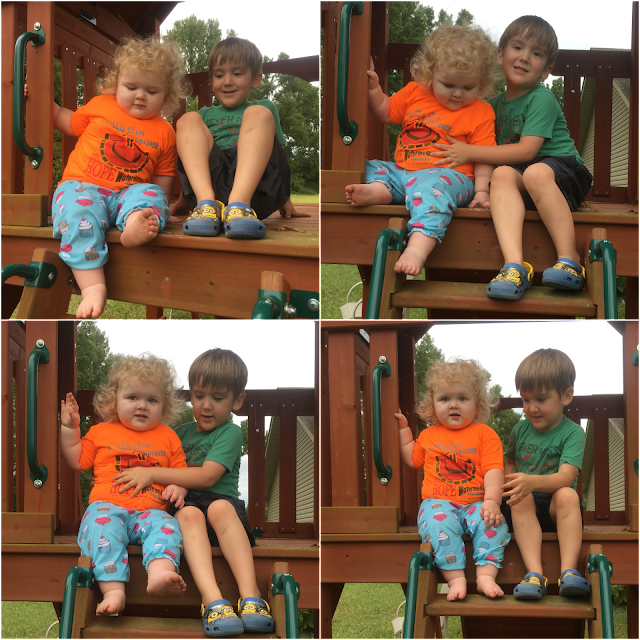 The adjustment into preschool hasn't been hard for Owen, he makes friends wherever he goes, but I was worried about him leaving his sister behind. They'd been together at day care as long as she could remember and their teacher told me he'd always been her favorite playmate. Thankfully her transition was fine, too. As long as she gets her afternoon Pop Tart promptly, things are peachy in her world. Plus, there's a new baby there who is much more interesting than the Baby she wags around. Time apart is healthy for each of the dynamics in my family, and it's great for these two who will be stuck together more often than not. It won't be long before I see these two sitting on the "sibling" bench in the car line. Fingers crossed for no fistfights. The way our school is set up my kids will be separated until high school. When they are in 9th and 12th grade they will be in the same class. Also I don't think I've ever told you, but I LOVE Nora's wild curls. They are so cute on her.